Jesus with a Crown of Thorns is a genuine bronze sculpture signed "J Clesinger, Rome," a French sculptor who lived 1814-1883. Born in Besancon, Jean Batiste Auguste Clesinger first exhibited in the Paris Salon in 1843. Famous examples of his statues are in Paris at the Jardin du Luxembourg, at the grave of Chopin in the Pere Lachaise Cemetery and in the Orsay Museum. 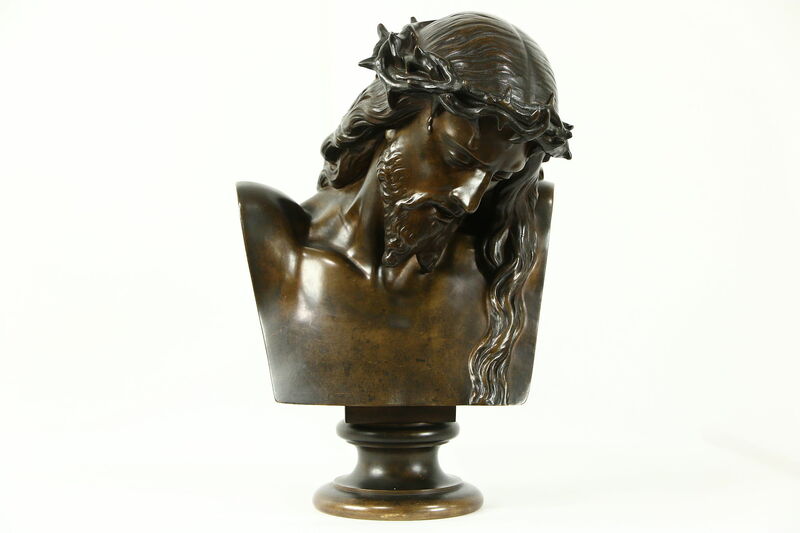 This bust has a rich deep bronze patina, and captures the pathos of the Crucifixion. There is a stamp from the renowned French foundry, "Barbedienne Fondeur." Measurements of this work of art are 11" wide, 10" deep and 16" tall.